Today marks the end of our fifth week on the diet, and I have to say things are getting easier now that our pantry is stocked and I know what to buy at each store. While it still feels like a lot of work each week, it really isn’t more than a few extra hours a week cooking from scratch. I am learning to make different dishes than my usual go-to, and I’m taking less shortcuts because I’m more conscious of the not-so-great ingredients that don’t feel worth it anymore. If you don’t like to cook, it might seem like a challenge at first. But there are enough convenience foods now available to help you out, especially if you are going for 90% compliance. Embracing good enough has been a huge part in my being able to stick with this diet - it prevents me from being too perfectionistic and obsessive about things or giving up because of an all-or-nothing mindset. It also creates space for everyone in our family to make choices and feel empowered. Before the plant paradox, I did my weekly grocery shopping at our local store while my kids are at piano lessons. And I’d make a trip to Costco every couple of months for staples. This was working for me because I hate shopping and I live in a relatively rural area where our local Trader Joe's and Costco is 40 min away and we don’t have a Whole Foods. Not surprisingly, I have found that this diet is easier when I plan ahead and have what I need on hand. It allows me more flexibility and minimizes the time I think about, shop for, and prepare food. If you are willing to eat salads and simple roasted veggies for most meals, this diet totally works. But with my kiddos, I’m finding they eat more and complain less when I make things that are more familiar to them like tacos, pasta, waffles, or smoothies. They really just want to feel normal and I can’t really blame them. The new Plant Paradox Cookbook has been helpful in adding some variety to our meal plans and planning ahead. Everything we’ve tried so far has been yummy - including bagels! So I am making those trips to Costco and TJs every other weekend for supplies, but I’m happy to do it now that I have don’t have to spend time wandering the aisles trying to figure out if something will work. We do have a great grocery store where I can find many ingredients for the recipes, and I’ve been able to supplement what I need by using Amazon or Thrive. I even found a local vendor at the farmers market for pastured meat. For those wondering what it costs to feed this family of four: last week I spent $91 at our local grocery, $161 at Trader Joe’s and $400 at Costco. Earlier in the month I spent $64 on pastured meat that will last us another 6 weeks. I expect to not need to go back to TJ or Costco for 2-3 weeks and only buy more produce at our farmers market or grocery in the mean time. Prepared veggies: cauliflower, broccoli, greens, etc. I’m down 10 pounds and am free of heartburn! The results I’ve been getting are enough motivation to keep eating this way. I plan to continue with Phase 2 of the diet, but in a couple of weeks I want to slowly reintroduce foods in Phase 3 that are low risk. Based on some of the early explanations about how going gluten-free can make it harder for people to ingest gluten in the future because they lack the microbes that used to help break down the foods, I want to have as wide a variety of foods available to me and my family even if we choose not to eat them daily. I also want to be able to enjoy more summer produce as it becomes available locally. We spend more time away from home in the summer and having increased options when staying with family or going out to eat seems easier, as long as we continue to feel good. I don’t think we’ll ever reintroduce cereal or ice cream as a regular part of our diet again, but we’ve found so many tasty alternatives that the desire to have those things is a lot less strong then it was a month ago! Another thing I’ve noticed is that my fridge and pantry are less packed than they used to be. I am definitely eating less than I did in the past and don’t feel the need to have things around ‘just in case.’ This is something that surprised me and feels lighter, like I am experiencing more freedom and have stepped out of fear in some way that is hard to explain. The toasts featured in the picture above are my favorite lunch right now - toasted Olivia Superfood Lyin’ Rye bread, Kite Hill chive cream cheese spread, home made sauerkraut with sea vegetables, and Prosciutto. I’m also loving Shutterbean’s Kale and Mint Slaw for lunches, substituting the cashews for blanched almonds and the agave for honey. Here are a few more recipes that we loved this week. This Caesar salad is so simple and delicious. I make the dressing every couple of weeks and we are ready for a side salad that kids love any day of the week. Put the dressing ingredients in a bowl and mix together with a whisk. Alternatively, you can put them in a magic bullet and blend them briefly. Taste and adjust seasoning with salt and pepper if needed. Depending on how big of a salad you want, tear or chop lettuce and put in a bowl. Add grated parmesan to taste. My daughter likes to use a vegetable peeler to make ribbons from the parmesan cheese to feel fancy. Add the dressing one spoonful at a time and mix salad, adding more as you like. You can store the leftover dressing in a mason jar in your fridge for a couple of weeks. Why go to all of the trouble to make your own onion salt? Because this salt is magic. It carried us through the first couple weeks of the diet and makes everything taste better. This is no ordinary onion salt - there is no bitterness, or harsh flavoring, no funny aftertaste. This sweet onion salt is a beautiful finishing salt that adds depth of flavor and a mild sweetness to everything it touches. 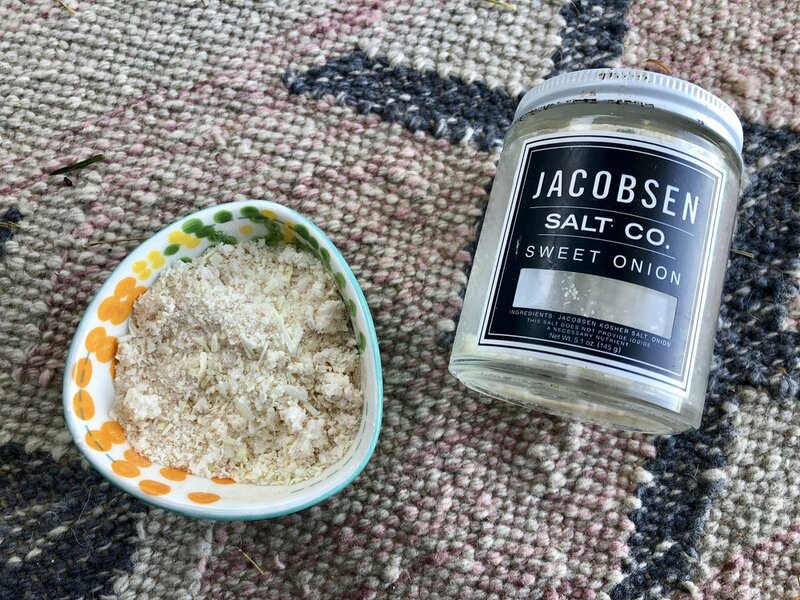 When I found out Jacobsen Salt Co was no longer making their Sweet Onion salt anymore, I had a mild panic attack. Luckily I was able to create something similar (and a whole lot cheaper) at home using my dehydrator. This salt is awesome on scrambled eggs. Or avocado toast. Or paired with goat cheese. Or on popped sorghum with ghee. Or soup and salad. You get the idea. Use this when you feel like you want to punch up the flavor on a savory dish. Slice sweet onions on a mandoline (or with a knife about 1/8 in thick). Spread evenly on dehydrator trays (my dehydrator has five trays and that was plenty). Dry at 125 degrees for 6-7 hours until they are completely dry (7 hours made a fine powder for me in the PNW on my deck in April). Grind onion slices in a clean coffee grinder a little at a time with a teaspoon of salt. Pulverize to the texture you like - I prefer finely ground with small clumps. Transfer to a small mason jar and store. It will pick up moisture the longer it is stored, but it still tastes yummy. 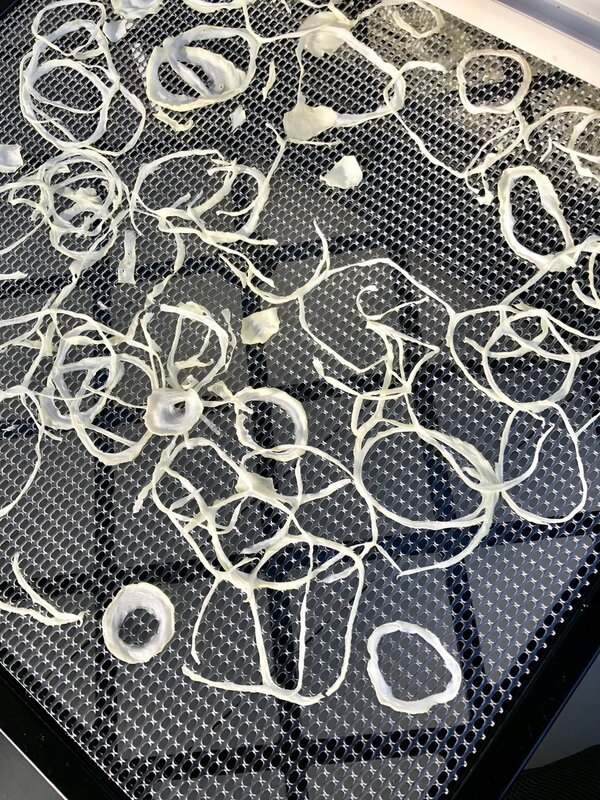 Makes about 1 cup of onion salt. If you prefer a flakier finishing salt, I’d use Maldon sea salt - instead of grinding them together, I’d add the onion powder to the flaky salt. This recipe from The Plant Paradox book is my son’s favorite breakfast. They taste like normal fluffy waffles. I make a big batch so that he can toast them as he wants them throughout the week. Toasting them gets them crunchier. These also make a great snack cold or on the go. I bring a batch when we go stay at a hotel to supplement the complementary breakfast. I made a blueberry topping that I cooked down with a little honey and it a nice little touch of sweetness. Sometimes we eat them with Vanilla Ghee and a little drizzle of maple syrup. I like them savory too, with caramelized onion and a runny egg or turkey with melted cheese. These waffles are packed with protein, so if you have someone who needs to increase their protein intake, this is a great option. Dump all the ingredients in a Vitamix and blend until smooth. If you don’t have a blender, you can risk the wet ingredients together first and add the dry. Using 1/4 cup measure, scoop the batter into a hot waffle iron and cook until ready (my waffle iron has a green light indicating it is finished, but they also stop steaming). These cook pretty quickly. Store extra waffles in a container in your fridge or freeze them in a ziplock bag. While technically a paleo granola recipe, this cereal is delicious and a little addictive. We eat it by the handful as a snack, with almond milk for breakfast, or on yogurt. I was going for the flavor of the clusters in Honey Bunches of Oats, but it has been so long since I’ve eaten that cereal I have no idea if I hit the mark! Regardless, this is REALLY good. We don’t like using Swerve or Just Like Sugar, so I stick with honey or maple syrup. In a food processor, blitz the nuts and coconut in batches until resembles coarse crumbs. You are going for a little bit of texture. Transfer to a large bowl and add the almond flour, maple syrup, and salt. Drizzle with coconut oil and stir to combine. Add the egg, mixing until the mixture clumps together. Spread mixture evenly on large rimmed baking sheet. Bake 20-30 minutes, stirring frequently, until golden brown. Turn off oven and give it another 10 minutes to get crunchier. Remove and let cool. Store in glass container for a couple of weeks. This filled 2/3 of a gallon jar I use for cereal. Makes approximately 30 servings.